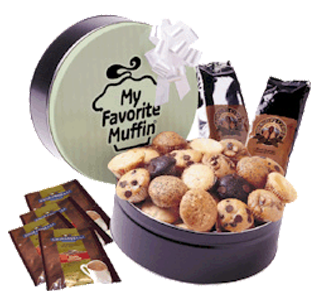 My Favorite Muffin® offers a variety of muffin gifts perfect for any occasion. 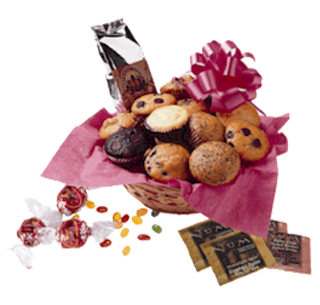 We take our mouth watering Mini Muffins and pair them with decadent chocolates, coffees, teas or candies. Whether it is a Brewster’s Sampler to thank your favorite teacher, a Chocolate Lover’s basket for mom, or an Ultimate Tin for any holiday, you’re sure to be a hit if you choose us to help you gift. 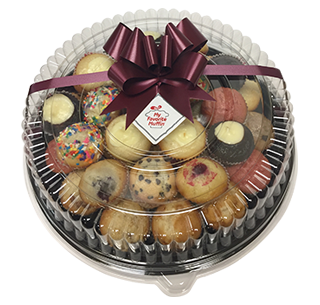 An assortment of our Mini Muffins on a 12”, 16” or 18”round tray with a clear dome lid, finished off with a ribbon and bow. Holiday time or anytime, everyone loves My Favorite Muffin®. 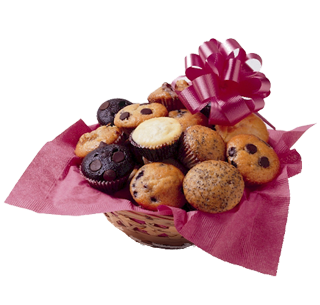 Send a delightful and delicious gift basket with assorted Mini Muffins. - Brewster's® Coffee 3-Pot Sampler Packs. All gift packs contain three 1.8 oz. packages of coffee, ground for your convenience for a drip coffee maker. 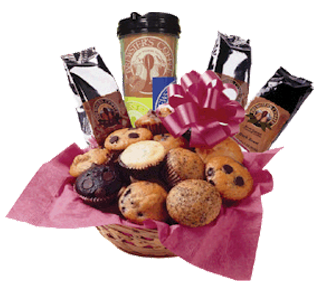 Our Brewster's Sampler comes with a travel mug, 3 one-pot samplers of Brewster's® Gourmet Coffee, 4 dozen Mini Muffins, and a card for your personal message. 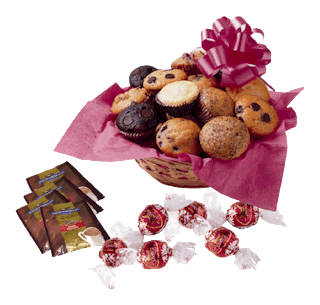 This 4 dozen Mini Muffins basket is perfect for the Chocolate Lover you know. They'll appreciate your kindness with 4 dozen Mini Muffins, 3 Lindor® Chocolate Truffles, 10 Numi® Tea bags, a half-pound of Jelly Belly® gourmet jelly beans plus a one-pot packet of delicious Brewster's® Coffee plus a card for your personal expression of thanks. 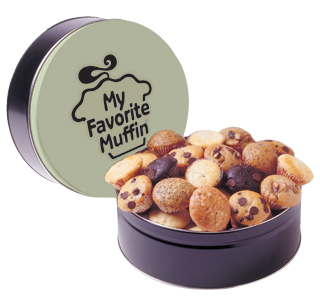 Three dozen delicious Mini Muffins await your lucky friends and family inside the My Favorite Muffin® Gift Tin. Afterwards, they can store a few of their favorite things. The Ultimate Tin includes three dozen Mini Muffins, four Gourmet Hot Cocoa packets, two one-pot packets of Brewster's Gourmet Coffee, and a card for your personal message. Afterwards, your friend will keep the tin to store a few of their favorite things. Order our award-winning jumbo muffins by the dozen! 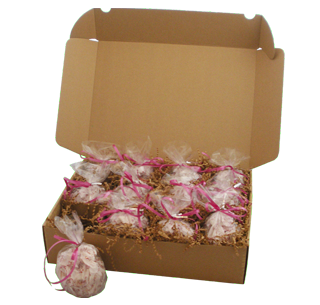 Choose one of our 2 combination boxes or a dozen of one single variety. 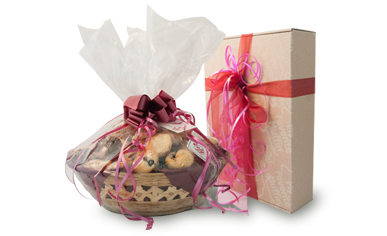 To keep them fresh: Our muffins freeze very well, so the people who receive your gifts will be able to enjoy each and every morsel of every muffin.